Posted By:Unknown | At:6:51 AM Be the first to comment! 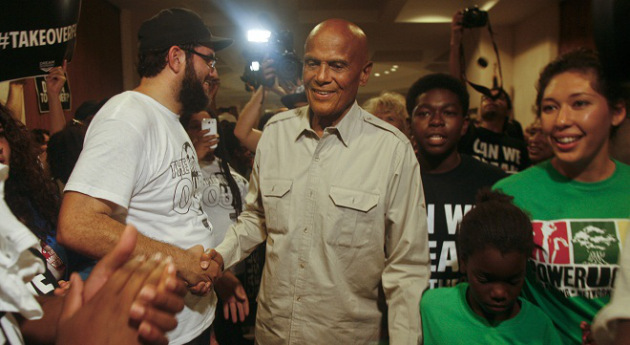 TALLAHASSEE, Fla. (AP) — Singer and entertainer Harry Belafonte on Friday called on Florida Gov. Rick Scott to listen to protesters who are asking for a special legislative session to examine the state’s self-defense laws after the acquittal of George Zimmerman. Protesters have occupied the Capitol since July 15 — or three days after a jury cleared Zimmerman of charges in the killing of 17-year-old Trayvon Martin. The group wants Scott to call a special session so legislators can change the state’s contentious “stand your ground” law but Scott has steadfastly refused. “At the moment all of this is governable, all of this is in a place where it can be debated and analyzed and discussed in a very peaceful, calm, productive way,” said Belafonte, who first rose to fame during the 1950s. Zimmerman, a neighborhood watch volunteer, was acquitted earlier this month of second-degree murder and manslaughter charges in the shooting death last year of Martin, an unarmed black teenager. Zimmerman’s attorneys maintained he shot Martin in self-defense, but the delay in arresting him sparked an outcry among civil rights groups and others. Zimmerman identifies himself as Hispanic. The main group leading the Capitol protests — the Dream Defenders — have maintained a constant presence for 11 straight days. While protesters come and go during the workday, a small band of them has spent every night sleeping in the hallways since the protest began. So far police have allowed them to remain. In the last few days the number of those camped out at the Capitol has begun to grow reported law-enforcement authorities. The Florida Department of Law Enforcement reported that 86 people spent Thursday night inside the building. FDLE has spent nearly $51,000 on overtime costs since the protest began. The state has spent more than $140,000 on overall security costs over the 11-day period but that includes normal security expenses. The protest was sparked by the Zimmerman verdict but the protesters want state officials to look at racial profiling, school district “zero tolerance” policies for students as well the “stand your ground” law that allows someone to use deadly force if they believe their life was threatened. Scott met with several protesters last week where he told them he would not call a special session. The protesters are now trying to utilize a clause in state law that allows for individual legislators to ask for a special session. Under the law the Secretary of State can poll all 160 members about a special session if 32 legislators ask for a special session in writing. It would then take a three-fifths vote for a session to be authorized. Ciara Taylor said the Dream Defenders have gotten 28 legislators to back the idea. But she said that she and others are prepared to remain at the Capitol for weeks in order to get what they want.